The dataset of the huge Lazaridis et al. 2016 paper is available for download (Reich Lab, BAM raw data). Great that the authors released the data before formal publication and even before peer review. I1293 North Iran Mesolithic (HotuIIIb): 1.5-2 year old individual. From Hotu Cave located in the foothills of the Alborz Mountains, near the modern town of Behshahr on the southern shore of the Caspian Sea in northern Iran. Excavated in the spring of 1951, and provides evidence of human occupation at various times from the early Mesolithic to the post-Achaemenid periods. Age is based on Hotu I skeleton 9480±40 bp (9119-8637 calBCE) because post-excavation reconstruction of the Hotu IIIb crania is suspected to have influenced/lowered the age estimate to 7250 ± 40 bp (6218-6034 calBCE). Own analysis: J2a-CTS1085(xCTS11251,PF5073). Coverage is very low for terminal placement. It is likely that this sample is J2a2 since J2a1-CTS11251 and J2a2a-PF5073 are negative. Hopefully a better NextGenSequencing of this sample will be done in the future. Iran, about 6 kilometers from the much larger Chalcolithic and Bronze Age site of Godin Tepe. Excavated between 1971 and 1973. Occupation lasted from the Late Neolithic through the Chalcolithic periods 13 . Radiocarbon dates obtained from Mound B range from 5630±80 bp (SI-4915) to 5020±70 bp (SI-4910) and a 95.4% calibrated confidence interval (4680-3662 calBCEP 14,15) is used. Own analysis: J2a2-PF5008,Z38487,PF5044(xL581,PF5058,PH2868,PF5030,PH1932). Coverage is acceptable for placement. Comparison with 1000 Genomes sample HG01589 might be useful but HG01589 has not a very high coverage. More J2a2-PF5050(xPF5058) NextGenSequences (at YFull) seem to be needed for comparison. PCAtest2 Eurogenes 2016-06-23 with 3DRIF-26 (Roman_Brits) and Jordan_EBA incl. I1730 on the lower right. Populations: ancient in color and modern in grey. I1730 North-Western Jordan Early Bronze Age (AG_84_3083_116): 2489-2299 calBCE (OxA-32775, 3925±31 bp). Early Bronze Age in a cave high above the East Field ‘Ain Ghazal on the outskirts of Amman occupied from around 8300-5000 BCE, followed by sporadic occupation in the Chalcolithic and Byzantine periods. Own analysis: J2b1-PF7331(xPF7312). Coverage is good enough to make a confident placement. Since I1730 is in the same haplogroup J2b1-M205 as the exogenous Roman era York 3DRIF-26 it is interesting to make autosomal admixture comparisons together with other Bronze and Iron Age Levant and nearby samples. See Eurogenes: A moment of clarity how well the two samples cluster on a PCA (Jordan_EBA & one Roman_Brits on the lower right). Since both autosomal and Y-haplogroup match it seems likely 3DRIF-26 was born near to the place of I1730. 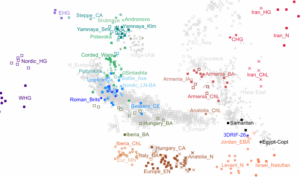 None of the M205 subclades under review could be identified in I1730 (not compared with subgroups of Sardinian samples). While pre-Bronze ancient J2a1b so far was only found in Mesolithic Caucasus (Kotias Klde cave, Western Georgia, sample KK1) in Jones et al 2015 and Neolithic Anatolia (Barcın, Northwestern Turkey, sample I0708/BAR6/L11-439) in Mathieson et al 2015 the other J2a clade J2a2a has now been found In West Iran. It is my impression that more Mesolithic or older samples as well as from other places (Mesopotamia, South and East Iran, Afghanistan, Pakistan, India) are needed to reconstruct interesting hypotheses about the origin of J2a. For J2b there is even more need for ancient DNA. The testing of deeper subclades for the two Neolithic Hungary J2’s in Szecsenyi-Nagy 2015 remains very interesting.